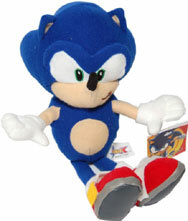 A mixture of new and old plushes will appear on this page. 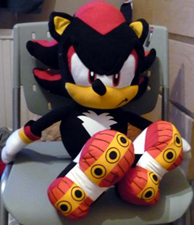 Keep in mind also that some of the plushes may have originated in the UK area, but could be available in other European countries as well. 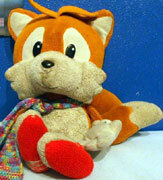 Especially with online retail being as popular as it is, it allows areas to share plushes. 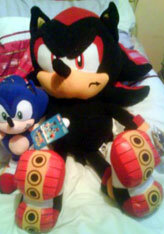 Some of the plushes you see here are not exclusive to the UK area but were originally sold there. 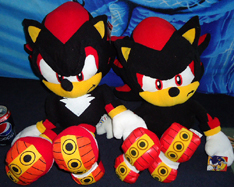 Check out these cool plushes! These are from the "SegaPrize" EU website. 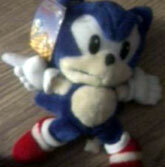 Each one seems to be a nice, solid-quality plush with attention to the detail and no real mutations. This is likely due to the close hand of Sega in the project. 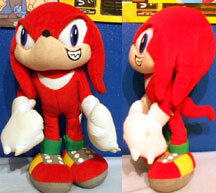 You can see Tails' fur/bangs detail, Shadow's 3D cuffs, Sonic's 3D buckles, and Knuckles has the tops to his shoes. 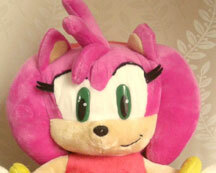 Amy's eyelashes are in control (but her head is a tad wide) And look... THUMBS for everyone! How unusual. This photo is of their 15 inch size (regarded as 'medium' so possibly other sizes will be released) They are made of "Velboa" which feels like fleece but presumably isn't as costly/wears better. Info & photo discovered by Sonikku. 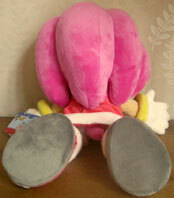 The first to get more photos is Amy Rose. She looks just fine from the back, with nice even spikes, quality dress and the fact she has fingers shows nicely. Her head has stuffed bangs...but the ears are off in position, with them facing eachother and her side spikes are huuugely wide. This makes her head look a little odd. Watch out: Play.com will only ship to Europe. They only have a phone #, so calling is unfriendly too. Unless you have a friend in Europe who can ship to you, you can't get them. usually not cut away and made of cloth. This is about 13 inches high and not all that common. As you can see with the 2nd photo, not all of them were the same, as this one has more evenly done eyes, and you can see they made the orange/white divide on the tails wavy. 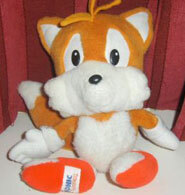 This was made by Tomy in 1992 (Perhaps because it didn't really look like Tails, no one bought them up?) Discovered by Berzerker. Rt. photo owned by Dexter. 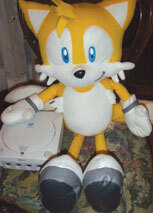 Here's a super big Tails plush! He's 2 ft 6 inches high...and is surprisingly well done. This was likely made by GOSH, who manufactures for amusements. They have "amusement only, not for resale" on the back of their hang tag. The eyes are embroidered on, and they got the straps to his gloves and even used a different fabric for the shoe-soles. The only thing out of place are the felt 'fur' tips that go at the top of his chest, on this they're actually down a bit low. 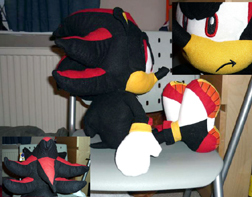 With these detail shots you can see the eyes and mouth are embroidered on well, but his body is kind of fat while the head & back spikes are rather small. "I'm just warming up!" 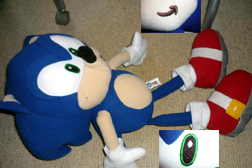 and "Soon we'll be back home Sonic, back home..." which is somewhat odd, but at least it is not a repeat of the "Giant Talking Figures" phrases, which is a help. Photographed & owned by Dexter. GOSH! 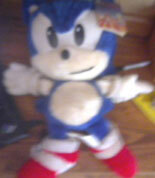 makes prize plushes for arcades, carnivals and amusements.